The old stone Church of Caraga, also known as San Salvador del Mundo Church (Christ, the Saviour of the World), is one of the chief attractions in the town of Caraga in Davao Oriental because of its historical importance and significance not only for the province and the island of Mindanao but for the whole country, as San Salvador del Mundo Church is where Christianity began in the eastern part of the Philippines. It is located at the heart of Poblacion (town center) of Caraga, about the 70 meters from the edge of a high promontory overlooking the Pacific Ocean. It is the oldest stone church and one of a few remaining Spanish colonial era churches in Mindanao. It was built in 1884 by a priest by the name of Fr. Pablo Pastells when the Jesuits took charge of the spiritual administration of the town in 1871 from the Augustinian Recollects. The Church was once used as a prison by Spaniards. 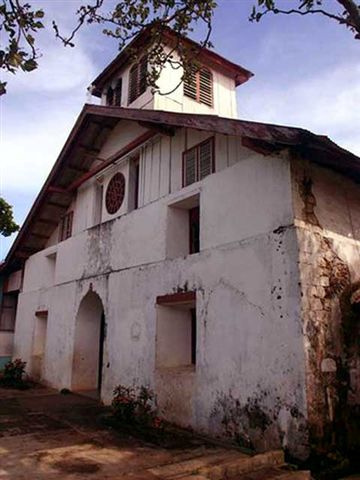 The Caraga Church is a simple structure made of coral and limestone blocks placed on top of each other, while the upper half is constructed mainly of wood. Upon the main door of the church is an inscription that bears a symbol of Christ which dates the structure's foundation in 1884. The interior has undergone much renovation since the church's centennial in 1996. Traces of the dilapidated retablos and old roofing can no longer be seen except for the remnants of narra hardwood posts and lateral walls which are still intact. 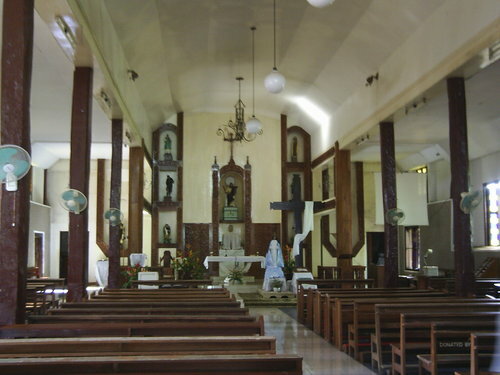 The Church houses several interesting artifacts that date back during its early years in the Spanish colonial era: the Church Bell that dates back to 1802; two centuries-old giant seashells that serve as holy water font for churchgoers; an antique baptismal basin made of marble which is still in use and kept at the baptistry located at right side near the entrance; an antique statue of San Isidro Labrador, the town’s patron saint, can still be seen in the altar; the centuries-old Baptismal registry with entries from the year 1835 up to the present which is still intact; and several antique parish records and archives which are all intact and safely kept and preserved inside a cabinet in one of the rooms of the church. The San Salvador del Mundo Church was declared a national historical site by the National Historical Commission of the Philippines on its parochial feast day last July 16, 2012. The Church now ranks among the country's newest national historical sites: Camp Crame in Quezon City; the Schoolhouse of the Women of Malolos; the Gomburza execution site and Jose Rizal's execution site in Rizal Park; the University of Sto. Tomas foundation place; the Recoletos Church and Convent in Intramuros, Manila; and the Graciano Lopez Jaena Shrine in Jaro, Iloilo City. Caraga, Davao Oriental is about a six-hour travel by land from Davao City.